The Airbus Helicopters EC120 B Colibri is a 5-seat light utility helicopter powered by a single Turbomeca Arrius 2F turbine engine. The EC 120 B Colibri, also known as Hummingbird, was developed with simplicity of design and low costs of maintenance in mind. It makes extensive use of composite materials and modern avionics. The new generation of fenestron tail rotor takes part in the decrease in external noise level, which makes the EC120 B ideal for missions near settled areas. The project started in 1990 when Aerospatiale of France, CATIC of China and Singapore Aerospace agreed in forming a partnership to develop a new light helicopter, then designated P-120L. Definition phase of the original P120L was subsequently redesigned with 500 kg lower gross weight and new engine and rotor. The helicopter divisions of Aerospatiale from France and MBB from Germany merged in January 1992 to form the Eurocopter Group. In October 1992, development of the new helicopter started and in January 1993, Eurocopter designation EC 120 was given to the helicopter. Mid-1993, the design definition was completed and assembly of first of two prototypes began at Eurocopter France at Marignane in early 1995. Eurocopter EC120 prototype F-WWPA c/n 1 flew first on 9 June 1995. The second prototype (F-WWPD c/n 2) was flown 17 July 1996. Certification to JAR 27 was achieved on 16 June 1997. Production of the EC 120 began on a small scale in 1997 at Eurocopter France's Marignane facility, with the first production Colibri (F-WWPL c/n 1005) flying on 5 December 1997. The airframes are made in China and the final assembly line of the EC120 is at the Eurocopter Marignane factory in France. Next to the final assembly of the EC120 in France, a number of helicopters were assembled in Australia and Brazil. On 11 June 2004, CATIC, HAI and Eurocopter signed a contract to set up an second assembly line to manufacture the EC120 helicopter in Harbin, China. The EC120 built by HAI - Harbin Aviation Industries Co., Ltd. (Hafei Aviation), part of AviChina Industry & Technology Company Ltd., is known as HC120. The HC120 is destined for the Chinese domestic market as well as the army's pilot training. In 2006, Regourd Aviation in France obtained EASA certification for the modified EC120 "Voyager", an EC120 with auto-pilot; glass cockpit & integrated avionics. The ICAO Aircraft Type Designator is EC20 for both the EC120 and HC120. Until 2016, more than 700 EC120 B helicopters have been delivered to 55 countries. Since March 2015, Airbus Helicopters uses “H120” as marketing designation for EC120 B helicopters. On 8 July 2003, the 2002-built Eurocopter EC120 B c/n 1324 was registered N496AE with American Eurocopter Corp. On 9 February 2005, the Colibri was registered as N263CP with Cannon Aviation Group Inc. and based in Belgium. On 13 July 2006, Southern Aircraft Consultancy Inc Trustee, Cornwall, UK, was registered as owner of the N263CP. Southern Aircraft Consultancy Inc. is an aircraft registration company in the UK, specialised in providing Individual Trust Agreements to non-US citizens to enable them to legally register their aircraft on the American "N" register. Eurocopter EC120 B Colibri N263CP is operating out of Becht in Belgium, and owned by Mr. van der Hoeven, the Netherlands. On 7 March 2007, Colibri N263CP crashed at Stadtlohn airfield, Germany, after it was hit by the rotorblades of Robinson R22 Beta II PH-JGR. The wreck of the Robinson was transported to Teuge and registration PH-JGR was cancelled as destroyed on 26 March 2007. The damaged N263CP was ferried to NHV in Ostend, Belgium, and rebuilt. On 26 August 2011, Colibri N263CP was amoung the helicopters of a private fly-in at the Hotel Weißer Bär in Mühlheim an der Mosel, Germany. The fly-in turned into a disaster as the tail end of storm "Bert" brought tennis-ball size hailstones, causing extensive damage to all 18 helicopters parked in the grounds of Hotel Weisser Bär. Colibri N263CP was substantial damaged and was ferried for rebuilt to Heli Holland Technics in Emmen, the Netherlands. 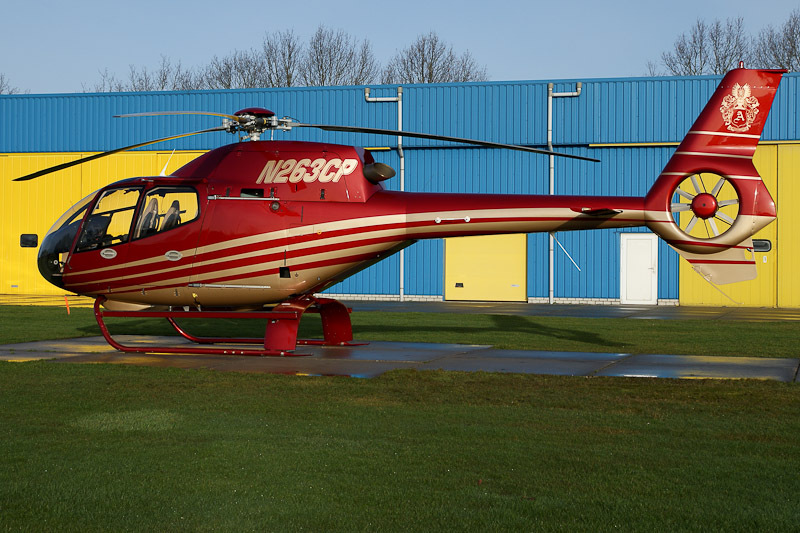 On 24 January 2012, EC120 B N263CP was seen like new after the makeover at the Heli Holland heliport.